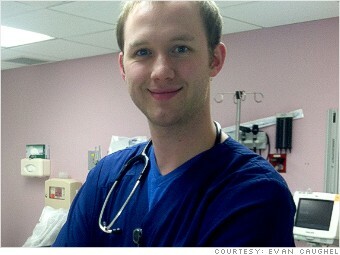 Is a male nurse a 'murse'? Related: I can't find a nursing job! I was drawn to nursing for two reasons. One was just necessity. I needed to make money and that was a field that was hiring, so I worked as an orderly during college. After doing that for about a year, I realized I really enjoyed it and I transferred into nursing school. Starting out, I was about one of five men in a class of about 55. When I started in the hospital, you really notice the difference. I work in the emergency room and some patients who come in, usually older men, don't want a male nurse. And there's one area -- maternity -- where men often are not welcome. I can understand that, and honestly, I have no want or need to be on the maternity floor. Sometimes, older patients think I'm a doctor. I often tell them, "No, no, believe me I'm not your doctor, I'm your nurse, but I'll take their paycheck if you want to give it to me." I've been called a male nurse and a "murse." It doesn't bother me much, but some of my colleagues hate that. Why does it have to be male nurse? Why can't we all just be nurses?